Situated in Funk Waterfowl Production Area, this 3-mile backcountry loop trail is a bird watcher’s paradise, providing habitat for millions of birds, including endangered whooping cranes and least terns that migrate biannually through the area. Turn left (East) on Road 736 and go 1.5 miles to trail head. 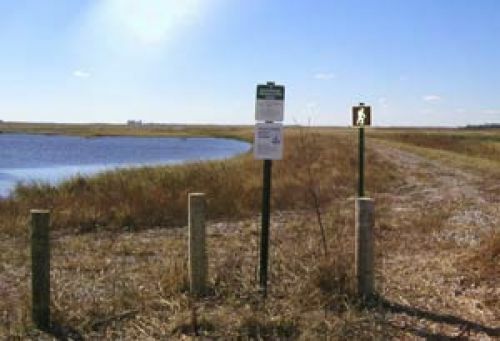 The Funk Peterson Trail is located on Funk Waterfowl Production Area (WPA), one of the largest Waterfowl Production Area in Nebraska. The WPA offers a pristine wetland and a grassland prairie ecosystem with diverse native plants and animals. During the fall and spring migration, millions of migratory birds which include waterfowl, shorebirds, and cranes make their way through this area in Nebraska. Endangered species such as whooping cranes and least terns also utilize this WPA making the Funk Peterson Trail a unique and excellent visitor opportunity. The trail offers many opportunities to get in touch with nature. Along the 3 mile backcountry loop trail, you can find a scenic viewpoint, interpretive signs, a handicap accessible wildlife viewing/hunting blind, a 650 foot concrete walkway with tracks imbedded from the local wildlife, and a 150 foot boardwalk that extends into the wetland, that will allow you to get a little closer to nature. Activities include hiking, photography, hunting, and educational opportunities. Rainwater Basin Wetland Mng. Dist.